Endlessly puzzling how to secure union of heaven and earth, the adult mind resorts to see image of the mountain. 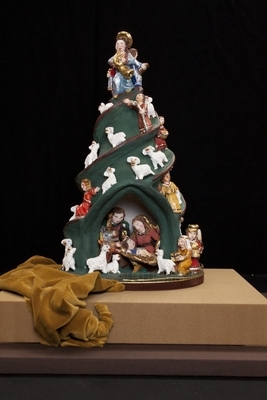 This crèche mountain of peasant-gothic style describes a downward spiraling movement ending with the cave of the nativity set deep inside the bottom of the mountain. There is a joyful Christmas procession witnessing God's saving grace in Christ. It penetrates all layers of human reality, even its darkest recesses. Hand sculpted and glazed terracotta figures created in Austria by R. Himmelbauer, depicting infant Jesus, Mary, Joseph, 3 Magi or wise men, angels, musicians, and various animals. Exhibition label originally written by Fr. Johann G. Roten, S.M. for exhibit entitled "At The Manger: No Place Like Home" held at Roesch Library, University of Dayton.